Delain have announced that they’ll release a new record titled Hunter’s Moon early next year. It’s the final part of a trilogy which also includes the Lunar Prelude EP and the Moonbathers album – and it’ll launch on February 22. Hunter’s Moon will feature four brand new tracks and selection of live cuts, and will be released on CD/Blu-ray, 2LP, deluxe box set and on digital and streaming platforms. 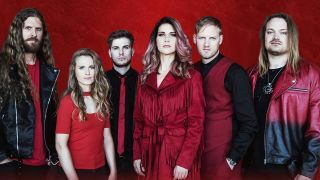 The Blu-ray will include footage filmed at the Tivoli in Utrecht during Delain’s Danse Macabre tour in 2017 and features special guests including Nightwish's Marco Hietala. Speaking about the new material, the band say: “Along with the live Blu-ray are four new studio tracks. Two of these offer a preview of what we are working on for our new full length studio album, which we expect to release in 2019. “Masters Of Destiny is a dramatic, cinematic track, that we’re excited to shoot an equally dramatic video for this week. The title track has more of a catchy feel and will hopefully appeal to our fans featuring heavy riffs, orchestrations, a large chorus and as a novel feature, Timo’s screams. “Our guitarists stepped to the forefront on this release, in writing This Silence Is Mine (Timo Somers) and Art Kills (Merel Bechtold). As for his guest appearance on the tour, Hietala says: “I was really pleased to do the tour because it gave me a chance to challenge myself in different surroundings and band dynamics. Hunter's Moon is currently available to pre-order exclusively through Napalm Records.